Ancient Greek history begins with the legendary age of gods, goddesses and heroes, occasionally tethered to fact by Bronze Age ruins. 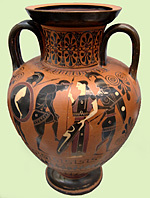 The collapse of the Mycenaean world was followed by several dark centuries, but written history eventually resumed as part of the artistic revival that arose in the Greek islands. In this classical era, Greek civilization reached its cultural zenith, with the rival city-states Athens and Sparta vying for dominance. 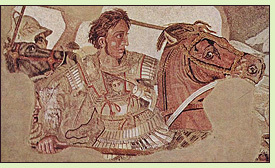 The Hellenistic Age encompassed the conquests of Alexander the Great and the era after his death when his successors struggled for mastery of his empire. This millennium-and-a-half span of Greek civilization has been treated unequally by historical novelists. 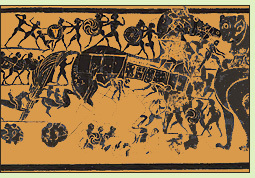 The Trojan War was shaped into epic from the moment the Greeks regained literacy some 2800 years ago, and then spilled across the stage of their emerging drama. Those ancient writers were among the greatest of all time, and the power of the material in their hands has lured more than a few modern novelists to tackle the same subject. The amazing story of Alexander the Great has likewise been retold many - at this point perhaps too many - times. But the Greek world after Alexander's death has been touched upon more fitfully in fiction. For example, no novelist seems to have tackled the wars fought by King Pyrrus of Epirus, the first great clash between Greece and the emerging Romans, nor has anyone seriously treated the crucial story of how Rome finally triumphed over the Macedonians. Happily, the phases of the story that have been told have been told well. By reading the best of these novels in historical order, a reader can begin to understand some of the most crucial phases in human history. I started my own journey decades ago with a select few novels set in the Mycenaean Age and two splendid novels on the heroic age of Greek legend by the widely and justly praised Mary Renault. Click on the listing to see a review. David Maclaine’s interest in the classical world was kindled in childhood, when a cousin showed him the strange toy soldiers he used to play "Greeks and Romans." By high school, he had discovered historical novels about Hannibal and Themistocles. All this led him to St. John’s College in Santa Fe, the "Great Books" school whose program starts off with immersion in the ancient Greek world: Plato and Aristotle, Herodotus and Thucydides, Euclid’s geometry and two years of ancient Greek. Later, he wrote features and reviews for Willamette Week and the column "Rembrandts and Reruns" in the monthly Black Lamb. He also picked up a Masters in English at Portland State University, exploiting his classical background to show how Hobbes stole from Thucydides, how Donne knew his Ptolemy, and how medieval Romances about Alexander the Great inspired a famous Monty Python scene. He is currently at work on a non-fiction book about some remarkable, little-known medieval women who turn out to be his ancestors. His website is davidmaclaine.wordpress.com.